Spending some time cooking with my daughter this week inspired me to think of more hands-on and practical ways to help people who haven’t had the love and support systems we have. I don’t spend enough time with my daughter, Hope. We’re both so busy with work and life, but I want to change that. This week we decided to spend some quality time together with my girlfriend Tracey at Chewton Glen, where I used to work. My daughter adores baking and would love to run her own tea room one day, specialising in proper, honest English afternoon tea. 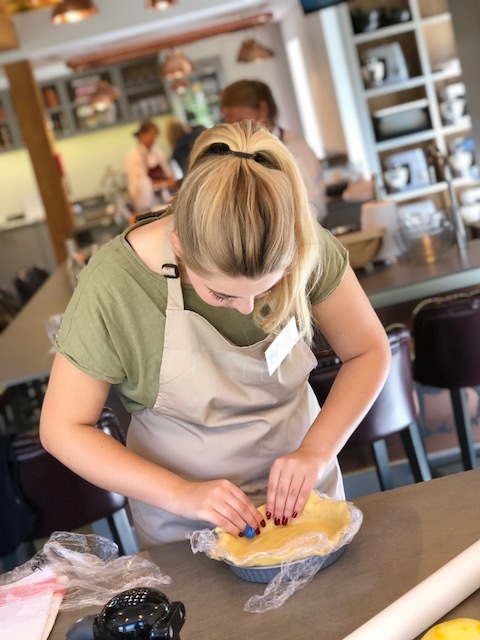 Chewton Glen has opened The Kitchen culinary school, so it was the perfect opportunity to spend the day baking simple stuff using amazing ingredients. The Bakewell tart was a highlight, with its crumbly buttery pastry, almond filling and fresh raspberry jam made on-site. We also made a mushroom, leek and gruyère pithivier, and a date and pecan loaf. I’ve visited, worked at and run at a fair few cookery schools in my time and I must say this was really well done, led by former pastry chef and high school lecturer Sally together with her impeccably organised team. They made the whole day a delightful outing with some fun competitive spirit between us all. It was also great to be back – I always say I learned to cook at The Savoy and polished my skills at Chewton Glen. I’ve kept in touch with a lot of people there and am often judging the same competitions as their Head Chef Luke Matthews. I thought it was a great way to enjoy time with someone I should spend a lot more time with, while showing my daughter a little bit about where I’ve come from and my culinary career journey. Getting hands-on to build relationships in my personal life got me thinking about how I can most effectively help people who haven’t had the love and care people like myself and my daughter have had. 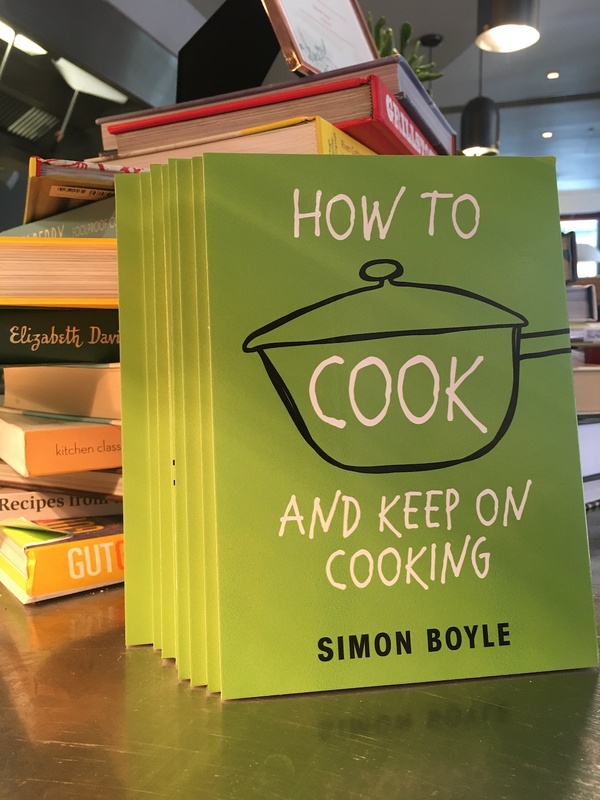 I’ve been working on the campaign for my new book How to Cook and Keep on Cooking (Penguin Random House), and we already have more than a dozen charities signed up to receive free copies of the book to give away to people who can really make use of it. But I wondered if we could add a hands-on, practical side to the campaign too. That led to me spending the afternoon with Fulham Youth Offending Service, who work with people who have committed offences, but they also try to stop people committing offences too. Members of their team specifically work on prevention and also with young people in the care system. Hearing about the reality of the issues from the team has troubled me ever since my visit. Children in care have very often gone through trauma and they’ve gotten into trouble because they don’t know how to deal with it. Chuck in an education system that doesn’t fit everybody, and you’re going to be seen as a troublemaker. Children in care are often bounced around between numerous foster families and care homes and the only constant person they have is a Virtual Teacher from the local area they originated from. But because care placements aren’t easy to find, a child might come from London but be sent to a foster family in Scotland. They get settled into a school, but three months later they might have to move onto a new foster family. I heard about an 11-year-old girl who has been moved around 52 times in this way. It's no wonder people get into all sorts of trouble and find themselves in situations they aren’t equipped to deal with. The issues related to homelessness often start way back in someone’s childhood, but it’s such a complex issue and the people in teams such as this are dealing with high caseloads. Despite the incredibly difficult backdrop we’re all working in, we discussed how we could work together to reach young people in a positive way through cooking. First we’re going to give copies of the book to the staff at Fulham Youth Offending Service, to let them experience it, understand what it’s all about and give them ideas for how they can approach young people in a new way through food. We’d also like to run some practical cooking sessions with young people, and given the locality and links with Premiership football, we’d like to partner with the football club and their catering partner to offer a tour of the stadium, meet a few players and then all cook together. We need to think of creative ways like this to inspire young people and give them opportunities they haven’t had before in life. We’ve got to put the idea into action now, but I’m excited about the potential. This week the government announced £100m will be spent to help tackle rough sleeping. It’s a start, but it’s not enough money and it doesn’t address all the issues. The whole system needs an extensive overhaul – it needs to properly help vulnerable people with complex needs navigate the exceptionally complicated system to gain the vital support they need. We should be inspired by countries like Finland who have created special pod housing for homeless people along with carefully designed support to get people standing on their own two feet again. Beyond Food is currently supporting an individual in an abusive relationship with a drug addiction. He can’t be moved into safe accommodation because of his substance misuse, but at the moment, misusing substances is the only thing that gets him through the issue of being mentally and physically abused. He could make himself homeless but we know what will happen to him if he does. We’re desperately trying to get him relocated and into a rehab facility, but the computer keeps saying ‘no’. I had lunch with a homeless man at Refettorio Felix this week, where we’ll be running a cooking project soon. He’s in his 50s and three years ago, he was being overcharged in private rented accommodation. He couldn’t afford his council tax bill and was subsequently kicked out. He’s been homeless ever since. He owes the council £1,600 and this is the reason he hasn’t had a bed to sleep in for three years. He’s got clothes but he doesn’t have underwear, which made me worry for his health and dignity. He’s been given food vouchers for a food bank, but he won’t use them because he thinks other people are more deserving. I’ve met lots of homeless people in my time, but the story of this man with a heart of gold really shocked and upset me. I left him getting support from the team – so I’m sure he’s being helped now. But I struggle to think how the government’s new funding is going to really address these issues. Our secret supper clubs are running between September and November, and are raising money to help tackle these issues. Join Nigel Haworth, James Golding, Chris King and myself - book now. This week’s recipe is a simple Chinese duck and tiger prawn salad with miso and orange dressing – perfect for summer.